Davey have an extensive range of pumps and pumping systemssuitable for all types of irrigation systems. Our centrifugal, multistage and submersible pumps are the ideal choice for efficient and reliable turf watering and agricultural irrigation pumping systems. High performance, quality materials and the Davey support network make these pumps ideal selection for irrigation pumping applications. 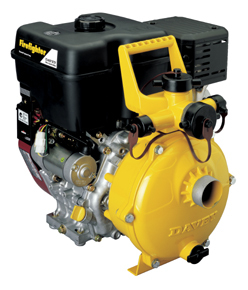 The Davey range of engine-driven self-priming pumps are versatile enough to handle a range of applications including firefighting, water transfer, irrigation, boom spraying, agricultural spraying (such as sheep jetting), and deep well jet pump applications. The required flow and pressure will determine which type of pump in the engine-driven self priming pump range suits your needs. Twin impeller models offer several operating advantages over single stage pumps – up to 50% more pressure, or the option of reducing the engine speed to conserve fuel and extend engine life. The Davey range of general-purpose electric pumps include single-stage and multistage centrifugal models, as well as jet-assisted single-stage centrifugal models. All feature Davey’s legendary reliability. Ideal for general water transfer or irrigation around the home, farm or commercial premises, these pumps are all designed to cope with varying water quality. Special models designed for salt water and a variety of benign chemical applications are also available. Davey ISOspec® CM-series close-coupled pumps and CF-series bareshaft pumps have been designed to international standard ISO 2858. These new pressure systems are sturdy, reliable, long-lasting and high performing – qualities that our customers know to depend on from Davey. Davey offers an extensive range of packaged pump sets, suitable for a wide variety of applications. Davey can also manufacture purpose-built pump sets, which can include any combination of Davey centrifugal, multi-stage or jet pumps specifically designed to meet the demands of the application. Control options range from standard electromechanical to the flexibility and power-saving capabilities of variable speed control. When the water you are pumping may contain soft solids, Davey self-priming open impeller centrifugal pumps are the answer. There’s a Davey model to handle your job, whether it be pumping water out of a basement, septic water removal or effluent disposal from a dairy or piggery. Davey stainless steel multistage pumps offer many unique features. The space-saving design of the inline-V series with the inbuilt thrust-bearing offers a wide operating range and the ability to use standard electric motors. The compactness of the M-series horizontal pumps with complete stainless steel hydraulic construction make these units suitable for a variety of applications. Reliability – that’s what you need in your bore – and with a Davey Submersible Borehole Pump, that’s what you get. Suitable for applications such as mine dewatering and turf watering, there’s a model to suit every need. Davey has been manufacturing borehole pumps for over 30 years, and every model features world-leading designs, exceptional material and legendary Davey reliability.